Singled out for special recognition of their many contributions to sport in the Taber area, Brandi Merritt-Miyanaga and Del Cleland have been inducted into the Taber and District Sports Hall of Fame. Hosted at the Heritage Inn on Saturday evening, the banquet and induction ceremony first saw taekwondo champion, national coach and instructor Merritt-Miyanaga take centre stage. Merritt-Miyanaga competed at multiple world championship-level events for international competition, taking many medals in the process from 2003-2011 in various pursuits where her travels took her to such exotic locales as Poland, Germany, Italy, Argentina, Spain and Ireland as either an athlete or coach. And this is not including the multiple medals she has received at either national or Western Canadian championships. Merritt-Miyanaga officially retired from active competition in 2015. Merritt-Miyanaga has brought her passion for the sport back to her country and community, coaching at the national level and operating her own school in Lethbridge and Taber. Next to take the stage would be Del Cleland, a long-time coach and mentor for many athletes throughout the area involved in high school sports. Cleland opened his acceptance speech by talking about some of the past inductees and their contributions, such as Dr. Gerald Beckie. Factoring in both W.R. Myers and community athletics, Cleland devoted decades to molding young minds in the Taber community, be it volleyball, baseball, basketball, hockey, track and field, gymnastics, skiing, and Southern Alberta Summer Games. 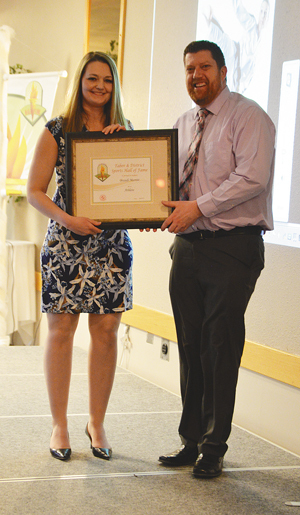 Among the honours in those sports, Cleland received a Max Gibb Award from the Southern Alberta Recreation Association (SARA). Cleland earned Varsity Coach of the Year four times for the Southern Alberta High School Volleyball League. During his lengthy high school volleyball tenure, Cleland was at the helm for three gold, four silver and two bronze at 3A provincial championships. Varsity volleyball teams at W.R. Myers were coached to 20 South Zone banners over 29 years. For both junior and senior varsity volleyball teams, Cleland earned 113 tournament titles over 32 years. All this, despite never having played volleyball as a child. The numerous accolades have not only earned Cleland a spot on W.R. Myers’ Wall of Fame, but also induction into the Alberta Schools Athletic Association Hall of Fame last year. Inductees in the recent past include Roy Baroldi (Builder, 2006), Ted Smith (Athlete, 2006), Doug Stevens (Builder, 2007), John Braun (Athlete, 2008), Bob Fettig (Builder, 2012), and Dale Tillman (Athlete, Builder, 2015).